Operating in the space of brand strategy, we often receive some version of the same question from our clients: “What are the most useful Google Analytics metrics, and where do I go to find these metrics?” In very relatable marketing terms, where can I go to see the return on my investment, and how can I use this information to drive future strategy and achieve greater impact? Back in November, a few of us here at R+M attended Internet Summit. Dave Fryer of Domo summed up the moral of this story nicely: you have to be able to loosely map your audience’s path to conversion on a napkin before you bring tools (like Google Analytics) into the mix. In other words, before you dive into Google Analytics, understand the general process your audience goes through in moving from the awareness phase of their journey all the way to following through on their purchasing decision. Remember: this isn’t a one (wo)man show – use the people who know your customers best to your advantage. Meet with your sales team, customer support specialists, or other individuals who regularly interact with your customers and prospects. Better yet, go straight to the source to validate your understanding of the customer’s buy cycle. Interview or survey your customers to find out where they’re getting stuck and which questions they have on their educational path to purchase. Have we been creating helpful content that informs various members of this audience at each phase in the buy cycle? Are we organizing the delivery of our content so it’s being found at the right time by the right people in the right place? Where and when the content was promoted and how the content is being tracked through these promotions. If you have this type of information in one place already, GREAT! You’re one step ahead of most by documenting your content and promotions strategy. If not, a simple content audit to assess your existing content library will take care of most of your questions. Now that you’ve: gotten to know your customers and their purchasing journey, prioritized your goals, and gotten a firm understanding of what content you currently have to help you reach those goals, it’s time to dive in. Let’s start with that first big question – Have we been creating helpful content that informs various members of our audience at each phase in their buy cycle? Find any disconnect between the content you’ve deemed as “important” and the content your users are actually reading. Example: What if we find that a page we have categorized as “very important” to our corporate goals isn’t being viewed at all. Are your customers’ interests not aligned with the content? Or are they simply not able to find it? Identify user confusion or unanswered questions. Example: what if we see that the pages with the greatest time spent on a page all originates from our FAQ section? Our intention with this content is typically to quickly and easily answer our prospects’ questions. Note: The Google Analytics behavior flow chart can be ugly (even overwhelming), but it’s important in helping you validate and refine the way your content is organized. In other words, your team might have one idea of how things should be presented, but your audience is navigating in a completely different manner. 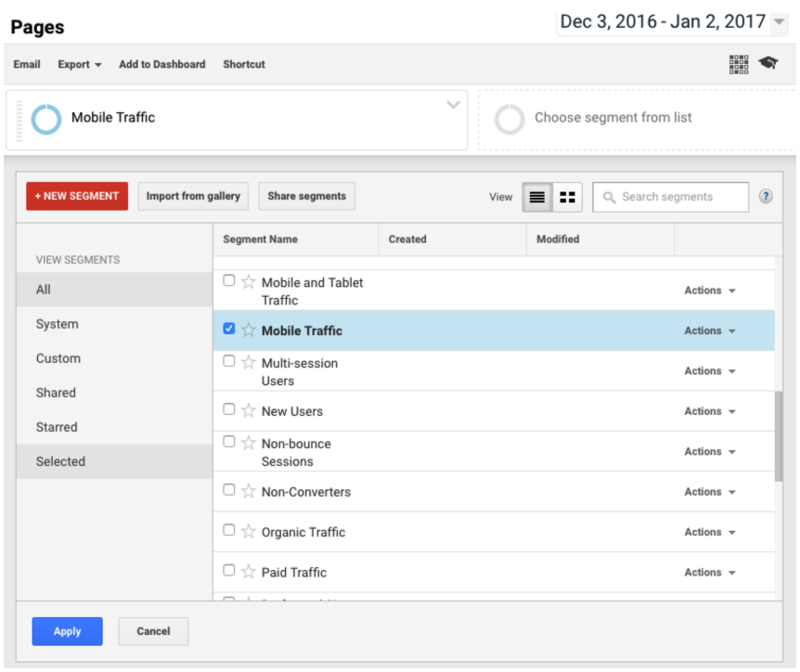 This, or funnels which may be set up through goals or segments, is a great way to spot trends in traffic patterns. This will show you: The pages on your site that are most likely ranking on the first few pages of organic search results for certain keywords. Compare how content performs when promoted via email vs. banner ad. Upon completion of your initial Google Analytics dive, remember to take the data with a grain of salt. It may be your instinct to want to allocate more budget to a promotional platform that showed success for your latest campaign – or to call in the designers to start redesigning a content type for the optimal mobile experience. But before you throw all your time, talent and treasure into one basket, take a step back. Ask yourself and your team questions like: will the same platform be appropriate for this next campaign that has a different audience? Was that 25-page white paper targeted for mobile readers in the first place? Prioritize. Create a strategy that promotes the iterative process. Looking for more information about how to use your data to help drive strategy? Have any thoughts you’d like to share regarding this article? E-mail UVP@rmagency.com.